A Federal High Court sitting in Ibadan, the Oyo State capital on Thursday ordered that former Minister of Federal Capital Territory (FCT), Chief Jumoke Akinjide and another stalwart of the Peoples Democratic Party (PDP) in Oyo State, Chief Olanrewaju Otiti be remanded in the custody of the Economic and Financial Crimes Commission ( EFCC) over the N650 million allegedly collected to fund the 2015 election in the state. The court also ordered the anti-graft agency to produce unfailingly the second defendant in the case, Senator Ayoade Adeseun who has failed to appear in court to face trial over the alleged fraud. Counsel to the first and second defendants, Oloye Jumoke Akinjide and Senator Ayoade Adeseun (at large), Chief Bolaji Ayorinde (SAN) and Chief Michael Lana announced their withdrawal from the case amidst heated argument over a ruling by the presiding Judge, Justice Joyce Abdul-Malik. In charge no FHC/IB/26c/2017, the defendants were accused to have conspired to take possession of N650millon unlawfully and committed an offence contrary to Section 18 (a) of the money laundry Act , 2012 and punishable under Section 15 (3) & 4 of the Act. Justice Abdul-Malik had asked that the 12-count charge be read out to the defendants, after which they pleaded not guilty. 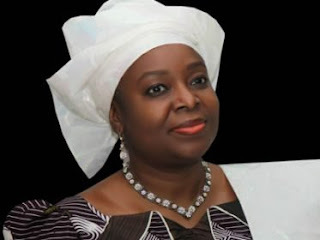 The charge sheet reads “That you Mrs Diezani Alison – Madueke (still at large), Oloye Jumoke Akinjide, Senator Ayo Ademola Adeseun and Chief Olanrewaju Otiti on or about the 26th day of March, 2015, in Nigeria within the jurisdiction of this honourable court conspired amongst yourselves to directly take possession of the N650million which sum you reasonably ought to have known forms part of the proceeds of an unlawful act and you thereby committed an offence contrary to Section (18) of the Money Laundering Act , 2012 and punishable under Section 15(3) & 4 of the same Act”. But counsel to the first defendant, Oloye Jumoke Akinjide, Chief Bolaji Ayorinde urged the court to refuse an alleged defective prosecution applications dated 9 March, 2017 and 20 March, 2017. Ayorinde said it was improper for prosecution counsel, Mr Rotimi Oyedepo to seek to substitute a charge without an order or permission of the court . He challenged the EFCC counsel for seeking to replace the originating charge with another charge sheet dated 20 March , contending that the charge sheet to be amended was defective. Chief Michael Lana, counsel to second defendant, Senator Ayo Adeseun in his argument while supporting the position of Chief Ayorinde submitted that once there was no seal in a charge sheet, it was deemed not to have been filed . The EFCC counsel, Mr Oyedepo, while reacting, argued that the contentious charge sheet was competent and valid before the court, since it carried a receipt issued by the NBA. However, Justice Abdul-Malik after listening to the submission of the counsel ruled that the court would not harbour any charge sheet not bearing the seal of the NBA, but ordered that the prosecution counsel could substitute the defective charge with the one with the NBA receipt. There was, however, emotional outburst, while the prosecution counsel was seeking to substitute the charge sheet, as the defence counsel rose against it , which led to the decision of the two defence counsels to announce their withdrawal from the case. Akinjide through an application had sought to enter into plea bargain. The prosecution counsel, Mr Oyedepo informed the court also that the parties had greed on the plea bargain agreement and that negotiation had commenced. Counsel to the third defendant (Chief Olanrewaju Otiti), Adeniyi Ishola aligned himself to the plea bargain agreement. Justice Abdul-Malik adjourned the case to September 12, 2017.